It’s worrisome that Poland is heading into a rough patch. Very important that their labor market be strong heading into the EMU referendum. I hope you are a fast reader, Lars–I’m hoping that you will make it all the way to the bottom of your stack! I have read “Good money” long ago George, but it is such an enjoyable book that I though it would good to bring along and I of course planning to write a post a on your book recommendations (and your books!). 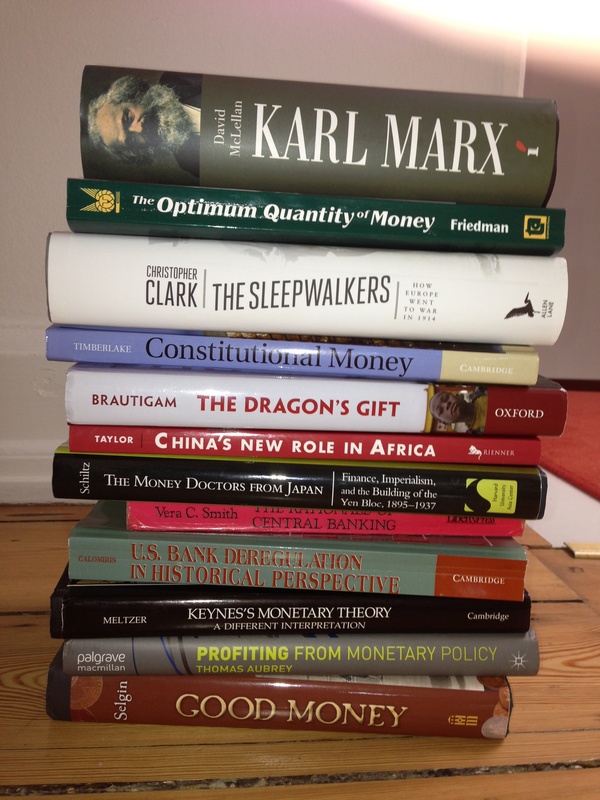 Btw George, the “Profiting from Monetary Policy” is in that stack because you. “Good Money” is one of the books I am reading too. I am also reading Keynes’s “A Tract on Monetary Reform”. No wonder Scott Sumner recommends it, JMK hovers very close to a full expectations analysis of monetary policy in Chapter III (which is where I am up to). I agreed – Keynes was a monetarist prior to General Theory. I hope you like om Aubrey’s book, Lars. had the pleasure of meeting Tom during my recent visit to England. A very intelligent and pleasant fellow. I have already read of some it. I must say it is very well-writen and it is very clear that Aubrey both knows his classics (Hayek, Wicksell etc.) and actually have insight from the financial markets. I disagree with a lot of what Aubrey writes, but that does not change the fact what what I read so far is very good.